What did you do this weekend? I spent my Sunday here in Osaka shopping for a fax machine. No, a time machine was not involved. Also this weekend, months after an odd on-air apology, the country’s most famous boy band SMAP announced it was disbanding. The announcement was made by, you guessed it, fax. This is no surprise because Japan is one of the few places on Planet Earth where fax machines continue to be widely used. 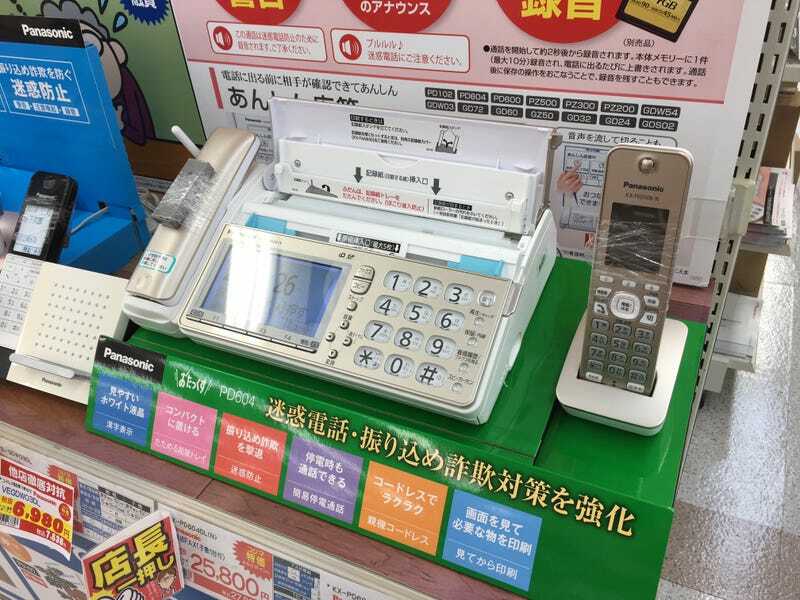 This is why seemingly every year, for the past few years, the international press has written articles on Japan’s love affair with fax machines (for example, here, here, here and here). It’s why I’m writing this one right now! Honestly, it should also come as no surprise that SMAP’s talent agency, Johnny & Associates, sent out the announcement via fax. The company, headed up by folks in their eighties, doesn’t exactly seem computer savvy (none of its groups, for example, have YouTube Channels, official Twitter accounts, or that much of an online presence). However, loads of other talent agencies — and companies in Japan — keep using fax machines. Which is why Japanese news show Mr. Sunday noted that the press release was sent out by fax as a simple fact but didn’t question WHY IN GOD'S NAME it was sent out via fax machine, as might have been the case in the west if One Direction, say, did the same. One reason often given for Japan’s continued fax-fixation is that it’s easier for Japanese people write out by hand because of the country’s complex and vast writing system. It's a definite 'maaaybe', but it’s in fact far easier to type things on a computer because of software autofill suggestions. Also, when companies like Johnny & Associates sent out faxes, they’re typed. On a computer. The other reason then is that people might think it’s often easier to print something out and then fax it, instead of sending it as an attachment. It’s often just how things are done, but that’s changing. I’ve always felt people buy fax machines because they feel like they’re supposed to buy them. In Japan, you need a home phone number. Some basic things are not possible without one. For example, when I arrived in Japan in 2001, you couldn’t even get a video store rental card unless you had a home phone number. So, when you go shopping for a landline, there are rows of fax machines that come with another cordless headset. This is the default home phone, even if you are not using the fax part of it on a regular basis. Having it means that in case you need to, you can. That’s why I’m getting a new one — just in case. Even though they seem outdated, Japanese fax machines are keeping pace with the times. Sort of. While shopping this weekend for one, I noticed all the different features that they have. For example, Panasonic’s latest fax machines have Wi-Fi and can connect to smartphones via an app to let people use their mobile phones on their landline number as well as read faxes on their smartphones. Which seems, in theory, rather garbled and unnecessarily complicated, but there you go. The in-store displays said things like it was possible to use the phone during blackouts, the numbers are easy to read, it’s possible to check who is calling, etc. Some of the machines' makers even offer paid services to filter out unwanted phone calls from sales companies or scammers. Features like these are clearly aimed at older customers. It’s not just older people that continue to use old-fashioned faxes, though. I do, too! Sometimes I need to send in forms or get things like price estimates on repairs or whatever. Traditionally, those have been sent via fax, but I was surprised when late last year, my car dealer offered to send an invoice by, gasp, email. Application forms, let’s say, for my kids’ summer camp or whatever used to be fax only, but sometimes now have the option to apply online. We still use the fax, but we’re using it less and less. Anecdotal evidence, I know. For the time being, I imagine the fax machine will stick around in Japan, finding use among folks who don’t have computers or find it easier to deal with hard copies. Sometimes, it is easier! 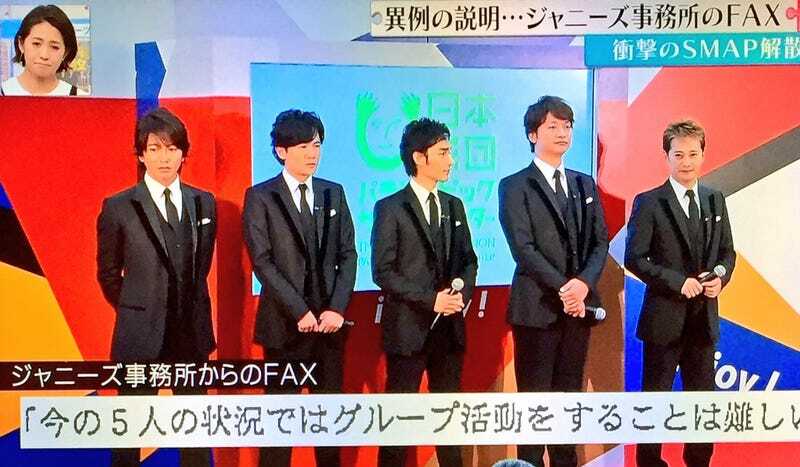 But like SMAP, a boy band filled with 40-year-olds, I don’t see fax machines sticking around forever. Just longer than elsewhere in the world.